Prepare well for the Confession. Frequent Confession is like a shower for your soul, cleansing you completely, giving you healing and freedom from sin. Frequent Confession is like a petrol for your soul, it keeps you going through the rough roads of our lives. 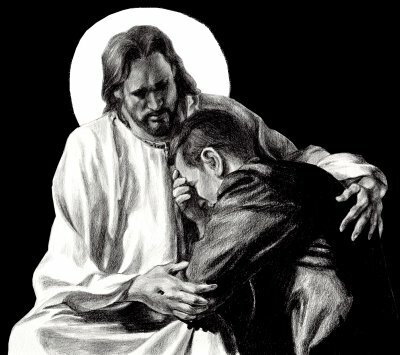 Sacrament of the Reconciliation is a superb grace. It is a big “SORRY” said to our Father in Heaven every time we do wrong, every time we fail or disappoint God, every time we fail to keep His Commandments. If you need help especially if you have been away for some time simply ask the priest and he will help you by “walking” you through the steps to make a good confession. Be truly sorry for your sins, ask God for the Holy Spirit to help you to examine your conscience, best way is to go through 10 Commandments and see if you kept them or not. 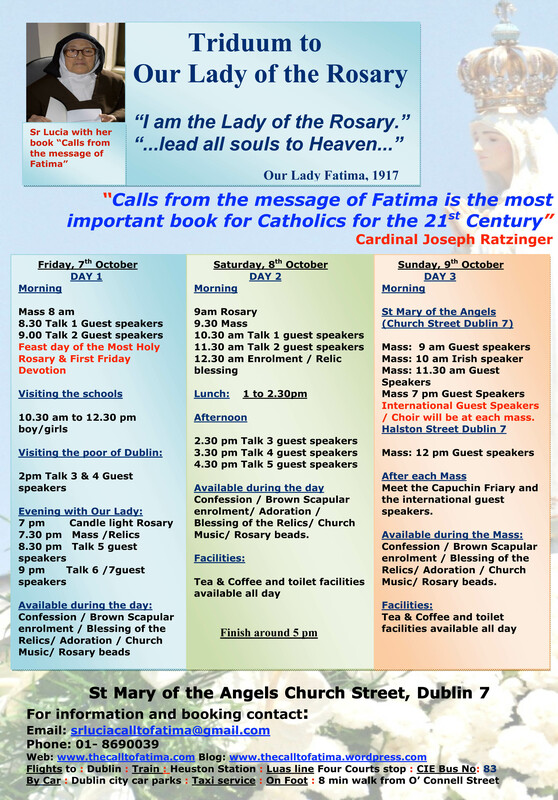 “The Call to Fatima” triduum in honour of Our Lady of the Rosary will take place at St Mary of the Angels Church, Dublin 7 on Friday 7th, Saturday 8th and Sunday 9th October 2011. Three days of prayer will emphasize the importance of the Fatima Message for our times, bringing along several experts on this topic. Triduum is organised in honour of Our Lady of the Rosary, feast day officially celebrated around the world on 7th October. It was in Fatima, Portugal, where the Virgin Mary stated, that she is the Lady of the Rosary to Lucia, Jacinta and Francisco. 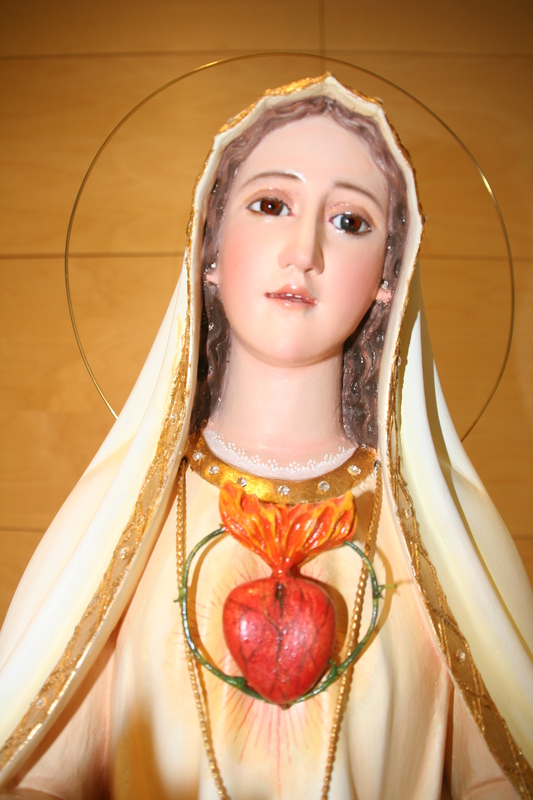 Our Lady of Fatima was especially loved by Saint Padre Pio, who is a patron saint of St Mary of the Angels Church, run by Irish Capuchin Franciscans. 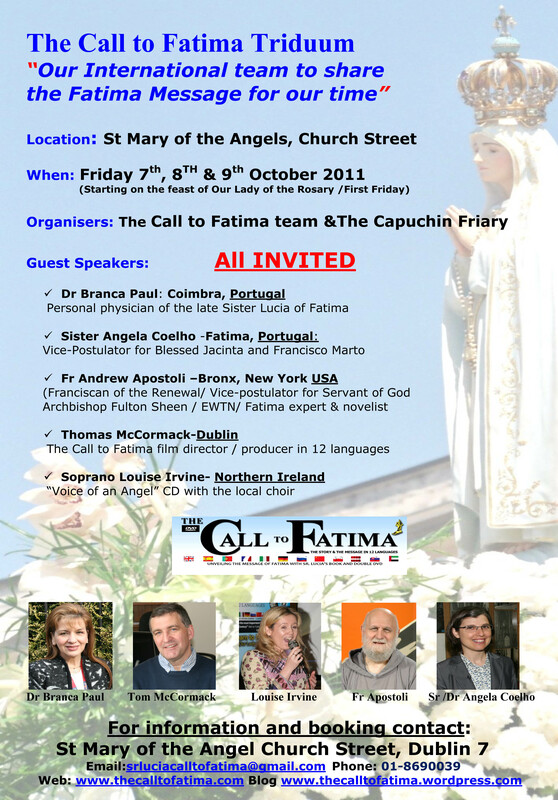 The key guest speakers are coming from around the world, including Fr Andrew Apostoli, Franciscan of the Renewal, New York, USA, Sister Angela Coelho, the Vice-Postulator for Blessed Jacinta and Francisco Marto, Fatima, Portugal, Doctor Branca Paul, the private physician of last visionary Sister Lucia, Coimbra, Portugal, Soprano Singer Louise Irvine from Northern Ireland and The Call to Fatima film producer & director Dubliner Thomas McCormack. During the Triduum the faithful will have the opportunity to view an exhibition of the Relics, those of Saint Padre Pio, Saint Teresa of Liseux (Little Flower), Saint Anthony, Blessed Francisco and Jacinta and many more. Masses will be scheduled as usual. Confessions, Music, Adoration and talks by guest speakers will take place over the three days. All are very welcome, especially youth and families, as well as different international community’s who have come to make their home in Ireland. In 1925 appeared to Sister Lucia, rested one hand on Lucia’s shoulder, while in the other hand she held a heart surrounded with thorns. Then Our Lady said to Lucia: “Look, my daughter, at my Heart surrounded with thorns with which ungrateful men pierce me at every moment by their blasphemies and ingratitude… You, at least, try to console me and say that I promise to assist at the hour of death, with the graces necessary for salvation, all those who on the first Saturday for five consecutive months, will confess, receive Holy Communion, recite five decades of the Rosary and keep me a company for 15 minutes while meditating of the mysteries of the Rosary, with intention of making reparation.”This is how Five First Saturday devotion came about. 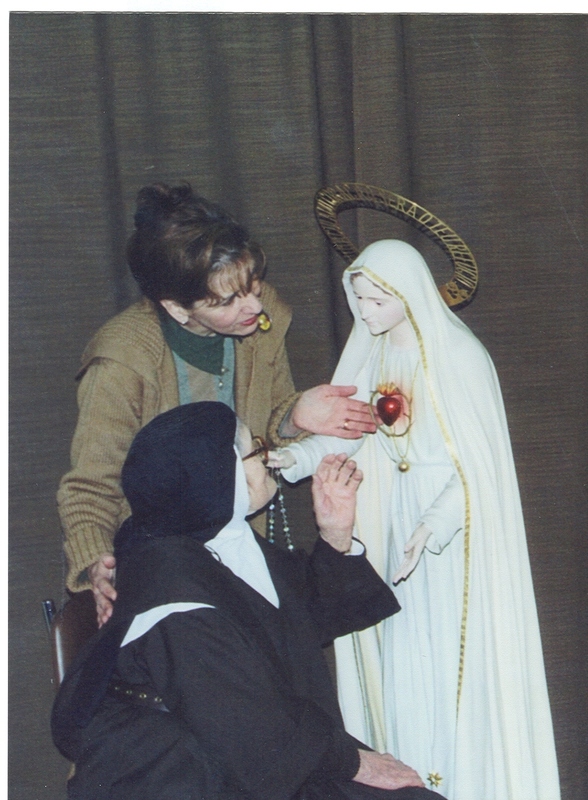 Our Heavenly Mother gave it to Sister Lucia, encouraging the faithful to pray the Rosary more and more, meditating on it and practising the Sacrament of Confession and Eucharist. Let’s not forget that Our Lady and Our Lord Jesus are hurt every single moment. Sometimes even by us… Tommorow is first Saturday of the Month. We encourage you to start this devotion, it is fine and purifying for our soul, and it helps to console Our Heavenly Mother. 1. Dear Brothers and Sisters of the Church in Ireland, it is with great concern that I write to you as Pastor of the universal Church. Like yourselves, I have been deeply disturbed by the information which has come to light regarding the abuse of children and vulnerable young people by members of the Church in Ireland, particularly by priests and religious. I can only share in the dismay and the sense of betrayal that so many of you have experienced on learning of these sinful and criminal acts and the way Church authorities in Ireland dealt with them. As you know, I recently invited the Irish bishops to a meeting here in Rome to give an account of their handling of these matters in the past and to outline the steps they have taken to respond to this grave situation. Together with senior officials of the Roman Curia, I listened to what they had to say, both individually and as a group, as they offered an analysis of mistakes made and lessons learned, and a description of the programmes and protocols now in place. Our discussions were frank and constructive. I am confident that, as a result, the bishops will now be in a stronger position to carry forward the work of repairing past injustices and confronting the broader issues associated with the abuse of minors in a way consonant with the demands of justice and the teachings of the Gospel. 2. For my part, considering the gravity of these offences, and the often inadequate response to them on the part of the ecclesiastical authorities in your country, I have decided to write this Pastoral Letter to express my closeness to you and to propose a path of healing, renewal and reparation. It is true, as many in your country have pointed out, that the problem of child abuse is peculiar neither to Ireland nor to the Church. Nevertheless, the task you now face is to address the problem of abuse that has occurred within the Irish Catholic community, and to do so with courage and determination. No one imagines that this painful situation will be resolved swiftly. Real progress has been made, yet much more remains to be done. Perseverance and prayer are needed, with great trust in the healing power of God’s grace. At the same time, I must also express my conviction that, in order to recover from this grievous wound, the Church in Ireland must first acknowledge before the Lord and before others the serious sins committed against defenceless children. Such an acknowledgement, accompanied by sincere sorrow for the damage caused to these victims and their families, must lead to a concerted effort to ensure the protection of children from similar crimes in the future. As you take up the challenges of this hour, I ask you to remember “the rock from which you were hewn” (Is 51:1). Reflect upon the generous, often heroic, contributions made by past generations of Irish men and women to the Church and to humanity as a whole, and let this provide the impetus for honest self-examination and a committed programme of ecclesial and individual renewal. It is my prayer that, assisted by the intercession of her many saints and purified through penance, the Church in Ireland will overcome the present crisis and become once more a convincing witness to the truth and the goodness of Almighty God, made manifest in his Son Jesus Christ. 3. Historically, the Catholics of Ireland have proved an enormous force for good at home and abroad. Celtic monks like Saint Columbanus spread the Gospel in Western Europe and laid the foundations of medieval monastic culture. The ideals of holiness, charity and transcendent wisdom born of the Christian faith found expression in the building of churches and monasteries and the establishment of schools, libraries and hospitals, all of which helped to consolidate the spiritual identity of Europe. Those Irish missionaries drew their strength and inspiration from the firm faith, strong leadership and upright morals of the Church in their native land. From the sixteenth century on, Catholics in Ireland endured a long period of persecution, during which they struggled to keep the flame of faith alive in dangerous and difficult circumstances. Saint Oliver Plunkett, the martyred Archbishop of Armagh, is the most famous example of a host of courageous sons and daughters of Ireland who were willing to lay down their lives out of fidelity to the Gospel. After Catholic Emancipation, the Church was free to grow once more. Families and countless individuals who had preserved the faith in times of trial became the catalyst for the great resurgence of Irish Catholicism in the nineteenth century. The Church provided education, especially for the poor, and this was to make a major contribution to Irish society. Among the fruits of the new Catholic schools was a rise in vocations: generations of missionary priests, sisters and brothers left their homeland to serve in every continent, especially in the English-speaking world. They were remarkable not only for their great numbers, but for the strength of their faith and the steadfastness of their pastoral commitment. Many dioceses, especially in Africa, America and Australia, benefited from the presence of Irish clergy and religious who preached the Gospel and established parishes, schools and universities, clinics and hospitals that served both Catholics and the community at large, with particular attention to the needs of the poor. In almost every family in Ireland, there has been someone – a son or a daughter, an aunt or an uncle – who has given his or her life to the Church. Irish families rightly esteem and cherish their loved ones who have dedicated their lives to Christ, sharing the gift of faith with others, and putting that faith into action in loving service of God and neighbour. 4. In recent decades, however, the Church in your country has had to confront new and serious challenges to the faith arising from the rapid transformation and secularization of Irish society. Fast-paced social change has occurred, often adversely affecting people’s traditional adherence to Catholic teaching and values. All too often, the sacramental and devotional practices that sustain faith and enable it to grow, such as frequent confession, daily prayer and annual retreats, were neglected. Significant too was the tendency during this period, also on the part of priests and religious, to adopt ways of thinking and assessing secular realities without sufficient reference to the Gospel. The programme of renewal proposed by the Second Vatican Council was sometimes misinterpreted and indeed, in the light of the profound social changes that were taking place, it was far from easy to know how best to implement it. In particular, there was a well-intentioned but misguided tendency to avoid penal approaches to canonically irregular situations. It is in this overall context that we must try to understand the disturbing problem of child sexual abuse, which has contributed in no small measure to the weakening of faith and the loss of respect for the Church and her teachings. Only by examining carefully the many elements that gave rise to the present crisis can a clear-sighted diagnosis of its causes be undertaken and effective remedies be found. Certainly, among the contributing factors we can include: inadequate procedures for determining the suitability of candidates for the priesthood and the religious life; insufficient human, moral, intellectual and spiritual formation in seminaries and novitiates; a tendency in society to favour the clergy and other authority figures; and a misplaced concern for the reputation of the Church and the avoidance of scandal, resulting in failure to apply existing canonical penalties and to safeguard the dignity of every person. Urgent action is needed to address these factors, which have had such tragic consequences in the lives of victims and their families, and have obscured the light of the Gospel to a degree that not even centuries of persecution succeeded in doing. 5. On several occasions since my election to the See of Peter, I have met with victims of sexual abuse, as indeed I am ready to do in the future. I have sat with them, I have listened to their stories, I have acknowledged their suffering, and I have prayed with them and for them. Earlier in my pontificate, in my concern to address this matter, I asked the bishops of Ireland, “to establish the truth of what happened in the past, to take whatever steps are necessary to prevent it from occurring again, to ensure that the principles of justice are fully respected, and above all, to bring healing to the victims and to all those affected by these egregious crimes” (Address to the Bishops of Ireland, 28 October 2006). With this Letter, I wish to exhort all of you, as God’s people in Ireland, to reflect on the wounds inflicted on Christ’s body, the sometimes painful remedies needed to bind and heal them, and the need for unity, charity and mutual support in the long-term process of restoration and ecclesial renewal. I now turn to you with words that come from my heart, and I wish to speak to each of you individually and to all of you as brothers and sisters in the Lord. You have suffered grievously and I am truly sorry. I know that nothing can undo the wrong you have endured. Your trust has been betrayed and your dignity has been violated. Many of you found that, when you were courageous enough to speak of what happened to you, no one would listen. Those of you who were abused in residential institutions must have felt that there was no escape from your sufferings. It is understandable that you find it hard to forgive or be reconciled with the Church. In her name, I openly express the shame and remorse that we all feel. At the same time, I ask you not to lose hope. It is in the communion of the Church that we encounter the person of Jesus Christ, who was himself a victim of injustice and sin. Like you, he still bears the wounds of his own unjust suffering. He understands the depths of your pain and its enduring effect upon your lives and your relationships, including your relationship with the Church. I know some of you find it difficult even to enter the doors of a church after all that has occurred. Yet Christ’s own wounds, transformed by his redemptive sufferings, are the very means by which the power of evil is broken and we are reborn to life and hope. I believe deeply in the healing power of his self-sacrificing love – even in the darkest and most hopeless situations – to bring liberation and the promise of a new beginning. Speaking to you as a pastor concerned for the good of all God’s children, I humbly ask you to consider what I have said. I pray that, by drawing nearer to Christ and by participating in the life of his Church – a Church purified by penance and renewed in pastoral charity – you will come to rediscover Christ’s infinite love for each one of you. I am confident that in this way you will be able to find reconciliation, deep inner healing and peace. You betrayed the trust that was placed in you by innocent young people and their parents, and you must answer for it before Almighty God and before properly constituted tribunals. You have forfeited the esteem of the people of Ireland and brought shame and dishonour upon your confreres. Those of you who are priests violated the sanctity of the sacrament of Holy Orders in which Christ makes himself present in us and in our actions. Together with the immense harm done to victims, great damage has been done to the Church and to the public perception of the priesthood and religious life. I urge you to examine your conscience, take responsibility for the sins you have committed, and humbly express your sorrow. Sincere repentance opens the door to God’s forgiveness and the grace of true amendment. By offering prayers and penances for those you have wronged, you should seek to atone personally for your actions. Christ’s redeeming sacrifice has the power to forgive even the gravest of sins, and to bring forth good from even the most terrible evil. At the same time, God’s justice summons us to give an account of our actions and to conceal nothing. Openly acknowledge your guilt, submit yourselves to the demands of justice, but do not despair of God’s mercy. You have been deeply shocked to learn of the terrible things that took place in what ought to be the safest and most secure environment of all. In today’s world it is not easy to build a home and to bring up children. They deserve to grow up in security, loved and cherished, with a strong sense of their identity and worth. They have a right to be educated in authentic moral values rooted in the dignity of the human person, to be inspired by the truth of our Catholic faith and to learn ways of behaving and acting that lead to healthy self-esteem and lasting happiness. This noble but demanding task is entrusted in the first place to you, their parents. I urge you to play your part in ensuring the best possible care of children, both at home and in society as a whole, while the Church, for her part, continues to implement the measures adopted in recent years to protect young people in parish and school environments. As you carry out your vital responsibilities, be assured that I remain close to you and I offer you the support of my prayers. I wish to offer you a particular word of encouragement. Your experience of the Church is very different from that of your parents and grandparents. The world has changed greatly since they were your age. Yet all people, in every generation, are called to travel the same path through life, whatever their circumstances may be. We are all scandalized by the sins and failures of some of the Church’s members, particularly those who were chosen especially to guide and serve young people. But it is in the Church that you will find Jesus Christ, who is the same yesterday, today and for ever (cf. Heb 13:8). He loves you and he has offered himself on the cross for you. Seek a personal relationship with him within the communion of his Church, for he will never betray your trust! He alone can satisfy your deepest longings and give your lives their fullest meaning by directing them to the service of others. Keep your eyes fixed on Jesus and his goodness, and shelter the flame of faith in your heart. Together with your fellow Catholics in Ireland, I look to you to be faithful disciples of our Lord and to bring your much-needed enthusiasm and idealism to the rebuilding and renewal of our beloved Church. All of us are suffering as a result of the sins of our confreres who betrayed a sacred trust or failed to deal justly and responsibly with allegations of abuse. In view of the outrage and indignation which this has provoked, not only among the lay faithful but among yourselves and your religious communities, many of you feel personally discouraged, even abandoned. I am also aware that in some people’s eyes you are tainted by association, and viewed as if you were somehow responsible for the misdeeds of others. At this painful time, I want to acknowledge the dedication of your priestly and religious lives and apostolates, and I invite you to reaffirm your faith in Christ, your love of his Church and your confidence in the Gospel’s promise of redemption, forgiveness and interior renewal. In this way, you will demonstrate for all to see that where sin abounds, grace abounds all the more (cf. Rom 5:20). I know that many of you are disappointed, bewildered and angered by the way these matters have been handled by some of your superiors. Yet, it is essential that you cooperate closely with those in authority and help to ensure that the measures adopted to respond to the crisis will be truly evangelical, just and effective. Above all, I urge you to become ever more clearly men and women of prayer, courageously following the path of conversion, purification and reconciliation. In this way, the Church in Ireland will draw new life and vitality from your witness to the Lord’s redeeming power made visible in your lives. It cannot be denied that some of you and your predecessors failed, at times grievously, to apply the long-established norms of canon law to the crime of child abuse. Serious mistakes were made in responding to allegations. I recognize how difficult it was to grasp the extent and complexity of the problem, to obtain reliable information and to make the right decisions in the light of conflicting expert advice. Nevertheless, it must be admitted that grave errors of judgement were made and failures of leadership occurred. All this has seriously undermined your credibility and effectiveness. I appreciate the efforts you have made to remedy past mistakes and to guarantee that they do not happen again. Besides fully implementing the norms of canon law in addressing cases of child abuse, continue to cooperate with the civil authorities in their area of competence. Clearly, religious superiors should do likewise. They too have taken part in recent discussions here in Rome with a view to establishing a clear and consistent approach to these matters. It is imperative that the child safety norms of the Church in Ireland be continually revised and updated and that they be applied fully and impartially in conformity with canon law. Only decisive action carried out with complete honesty and transparency will restore the respect and good will of the Irish people towards the Church to which we have consecrated our lives. This must arise, first and foremost, from your own self-examination, inner purification and spiritual renewal. The Irish people rightly expect you to be men of God, to be holy, to live simply, to pursue personal conversion daily. For them, in the words of Saint Augustine, you are a bishop; yet with them you are called to be a follower of Christ (cf. Sermon 340, 1). I therefore exhort you to renew your sense of accountability before God, to grow in solidarity with your people and to deepen your pastoral concern for all the members of your flock. In particular, I ask you to be attentive to the spiritual and moral lives of each one of your priests. Set them an example by your own lives, be close to them, listen to their concerns, offer them encouragement at this difficult time and stir up the flame of their love for Christ and their commitment to the service of their brothers and sisters. The lay faithful, too, should be encouraged to play their proper part in the life of the Church. See that they are formed in such a way that they can offer an articulate and convincing account of the Gospel in the midst of modern society (cf. 1 Pet 3:15) and cooperate more fully in the Church’s life and mission. This in turn will help you once again become credible leaders and witnesses to the redeeming truth of Christ. A young person’s experience of the Church should always bear fruit in a personal and life-giving encounter with Jesus Christ within a loving, nourishing community. In this environment, young people should be encouraged to grow to their full human and spiritual stature, to aspire to high ideals of holiness, charity and truth, and to draw inspiration from the riches of a great religious and cultural tradition. In our increasingly secularized society, where even we Christians often find it difficult to speak of the transcendent dimension of our existence, we need to find new ways to pass on to young people the beauty and richness of friendship with Jesus Christ in the communion of his Church. In confronting the present crisis, measures to deal justly with individual crimes are essential, yet on their own they are not enough: a new vision is needed, to inspire present and future generations to treasure the gift of our common faith. By treading the path marked out by the Gospel, by observing the commandments and by conforming your lives ever more closely to the figure of Jesus Christ, you will surely experience the profound renewal that is so urgently needed at this time. I invite you all to persevere along this path. 13. Dear brothers and sisters in Christ, it is out of deep concern for all of you at this painful time in which the fragility of the human condition has been so starkly revealed that I have wished to offer these words of encouragement and support. I hope that you will receive them as a sign of my spiritual closeness and my confidence in your ability to respond to the challenges of the present hour by drawing renewed inspiration and strength from Ireland’s noble traditions of fidelity to the Gospel, perseverance in the faith and steadfastness in the pursuit of holiness.In solidarity with all of you, I am praying earnestly that, by God’s grace, the wounds afflicting so many individuals and families may be healed and that the Church in Ireland may experience a season of rebirth and spiritual renewal. 14. I now wish to propose to you some concrete initiatives to address the situation. At the conclusion of my meeting with the Irish bishops, I asked that Lent this year be set aside as a time to pray for an outpouring of God’s mercy and the Holy Spirit’s gifts of holiness and strength upon the Church in your country. I now invite all of you to devote your Friday penances, for a period of one year, between now and Easter 2011, to this intention. I ask you to offer up your fasting, your prayer, your reading of Scripture and your works of mercy in order to obtain the grace of healing and renewal for the Church in Ireland. I encourage you to discover anew the sacrament of Reconciliation and to avail yourselves more frequently of the transforming power of its grace. Particular attention should also be given to Eucharistic adoration, and in every diocese there should be churches or chapels specifically devoted to this purpose. I ask parishes, seminaries, religious houses and monasteries to organize periods of Eucharistic adoration, so that all have an opportunity to take part. Through intense prayer before the real presence of the Lord, you can make reparation for the sins of abuse that have done so much harm, at the same time imploring the grace of renewed strength and a deeper sense of mission on the part of all bishops, priests, religious and lay faithful. I am confident that this programme will lead to a rebirth of the Church in Ireland in the fullness of God’s own truth, for it is the truth that sets us free (cf. Jn 8:32). Furthermore, having consulted and prayed about the matter, I intend to hold an Apostolic Visitation of certain dioceses in Ireland, as well as seminaries and religious congregations. Arrangements for the Visitation, which is intended to assist the local Church on her path of renewal, will be made in cooperation with the competent offices of the Roman Curia and the Irish Episcopal Conference. The details will be announced in due course. I also propose that a nationwide Mission be held for all bishops, priests and religious. It is my hope that, by drawing on the expertise of experienced preachers and retreat-givers from Ireland and from elsewhere, and by exploring anew the conciliar documents, the liturgical rites of ordination and profession, and recent pontifical teaching, you will come to a more profound appreciation of your respective vocations, so as to rediscover the roots of your faith in Jesus Christ and to drink deeply from the springs of living water that he offers you through his Church. In this Year for Priests, I commend to you most particularly the figure of Saint John Mary Vianney, who had such a rich understanding of the mystery of the priesthood. “The priest”, he wrote, “holds the key to the treasures of heaven: it is he who opens the door: he is the steward of the good Lord; the administrator of his goods.” The Curé d’Ars understood well how greatly blessed a community is when served by a good and holy priest: “A good shepherd, a pastor after God’s heart, is the greatest treasure which the good Lord can grant to a parish, and one of the most precious gifts of divine mercy.” Through the intercession of Saint John Mary Vianney, may the priesthood in Ireland be revitalized, and may the whole Church in Ireland grow in appreciation for the great gift of the priestly ministry. I take this opportunity to thank in anticipation all those who will be involved in the work of organizing the Apostolic Visitation and the Mission, as well as the many men and women throughout Ireland already working for the safety of children in church environments. Since the time when the gravity and extent of the problem of child sexual abuse in Catholic institutions first began to be fully grasped, the Church has done an immense amount of work in many parts of the world in order to address and remedy it. While no effort should be spared in improving and updating existing procedures, I am encouraged by the fact that the current safeguarding practices adopted by local Churches are being seen, in some parts of the world, as a model for other institutions to follow. I wish to conclude this Letter with a special Prayer for the Church in Ireland, which I send to you with the care of a father for his children and with the affection of a fellow Christian, scandalized and hurt by what has occurred in our beloved Church. As you make use of this prayer in your families, parishes and communities, may the Blessed Virgin Mary protect and guide each of you to a closer union with her Son, crucified and risen. With great affection and unswerving confidence in God’s promises, I cordially impart to all of you my Apostolic Blessing as a pledge of strength and peace in the Lord. On 10th December 1925, the most holy Virgin appeared to sister Lucia, and by her side, elevated on a luminous cloud, was a child. The most holy Virgin rested her hand on her shoulder, and as she did so, she showed to Sr Lucia a heart encircled by thorns, which she was holding in her other hand.